Thank you for joining me as we count down to the next MFT release. We are two short days away from the big day! All the new Stamps, Die-namics, and Stencils will be available on Tuesday, October 14th at 10:00pm EST. Be sure to check out the MFT Blog to see all the new items being revealed today. Don't forget to leave a comment on the MFT Blog Countdown posts, YOU could win one of the seven $75.00 gift vouchers. I have a non Christmas card to share with you today, it features the fabulous Perk Up stamp set and Coffee Cup Die-namics. Even though I am a tea drinker through and through, I still think this set is fantastic! 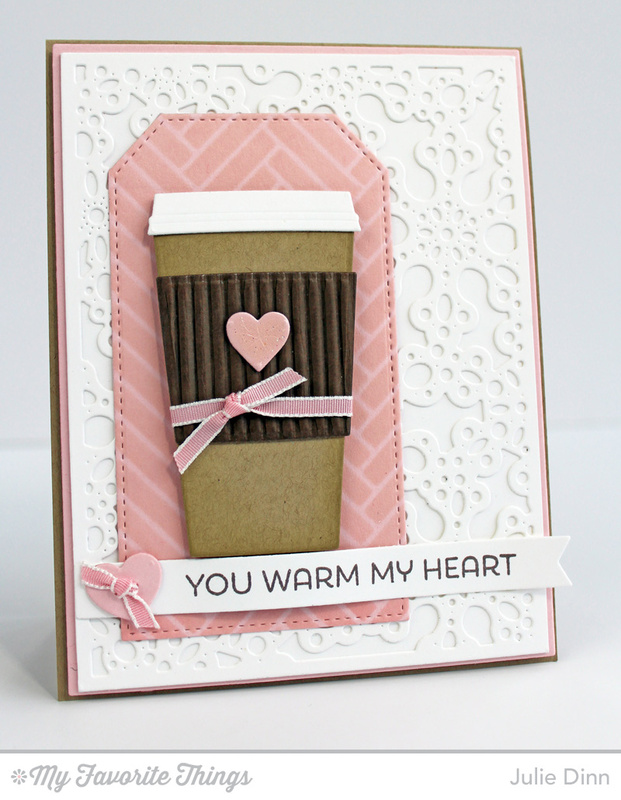 The Coffee Cup was die-cut in Kraft and Smooth White card stock. The band was die-cut in brown corrugated card stock. The small heart has a touch of glitter from the Sheer Sparkle Glitter Glaze. The Stitched Traditional Tag was die-cut in Pink Lemonade card stock. I used the Herringbone Bricks Stencil and Pink Lemonade Hybrid Ink to sponge the background on the tag. The background of the card was created with the Snowflake Fusion Cover-Up Die-namics. I can't seem to stop using this fabulous die. On the inside of the card, I stamped a sentiment from the Perk Up stamp set in Chocolate Brown Hybrid Ink. Thanks so much for joining me again today. Be sure to check out the MFT Blog to see all the gorgeous creations the Design Team has to share with you. I can't wait to crimp my cup cozy!!! Love this! Wonderful texture. the crimped belly band is fabulous. Very cute cards and the crimped holder really adds dimension. Clever and caffeinated! Love this card. Great card! Love the crimped holder! Love the background and pretty colors. Love the colors and that awesome background die! There are so many wonderful things being released that I may be in trouble. lol Thanks for sharing. What a great sentiment,! This is sure to make someone smile! Beautiful! I love the corrugated cup cozy on the cup - so cute. This is a pleasant looking card and also one that could be used during breast cancer awareness month, which would be a sure hit for someone needing support and happiness. cute card, Julie. love the pink and kraft combo. Such a clean fresh card. 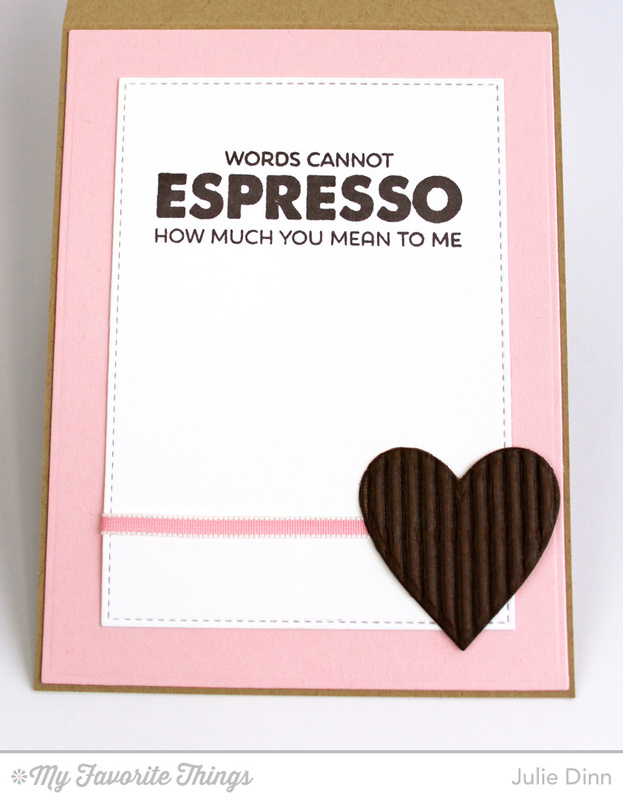 Love the simplicity of this card. So many good choices in this release, yikes! such a beautiful card, Julie, my favourite today!!! Love your color choice. The crimped sleeve is awesome! Great card. I love the texture! um, WOW! I love this. Such a warm cozy card with that yummy texture and soft color palette! Festive Friday #9 - Ho Ho Ho!